The computed tomography scan showed a loop of bowel and areas suspicious for extraluminal air and fluid. These findings suggested a strangulated hernia with perforation, and the patient was taken emergently to the operating room. In the operating room, a lower midline incision was made. Extraperitoneal dissection was performed to separate the peritoneum from the anterior abdominal wall. The left inguinal hernia neck was identified at the internal inguinal ring. The peritoneum was subsequently opened to reduce both the small bowel and colon entering the hernia defect. The hernia contained loops of healthy-appearing small bowel and a markedly dilated cecum (approximately 10 cm in diameter). There were multiple areas of patchy necrosis with punctate leakage of intraluminal contents. The appendix was also identified and found to be normal. A right hemicolectomy with primary anastomosis was performed. The hernia sac was then ligated at the neck and the peritoneum was closed. Flat Vicryl mesh was placed over the left inguinal hernia defect and the abdomen was closed. At a 3-month postoperative evaluation, the patient had no evidence of recurrence. Our case describes a left-sided Amyand hernia with a normal-appearing appendix. Although the appendix was not inflamed, the cecum was infarcted and had microperforations, necessitating a resection. The hernia repair was performed with a preperitoneal technique using an absorbable mesh owing to contamination from cecal perforation. The Editor welcomes contributions to the Image of the Month. Manuscripts should be submitted via our online manuscript submission and review system (http://manuscripts.archsurg.com). Articles and photographs accepted will bear the contributor's name. 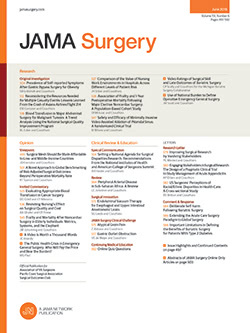 Manuscript criteria and information are per the Instructions for Authors for Archives of Surgery (http://archsurg.ama-assn.org/misc/ifora.dtl). No abstract is needed, and the manuscript should be no more than 3 typewritten pages. There should be a brief introduction, 1 multiple-choice question with 4 possible answers, and the main text. No more than 2 photographs should be submitted. There is no charge for reproduction and printing of color illustrations. Correspondence:Ashkan Moazzez, MD, Department of Surgery, University of Southern California Keck School of Medicine, 1510 San Pablo St, Ste 514, Los Angeles, CA 90033 (amoazzez@surgery.hsc.usc.edu). Accepted for Publication:January 13, 2009. Author Contributions:Study concept and design: Sun, Moazzez, and Mason. Acquisition of data: Sun and Moazzez. Analysis and interpretation of data: Sun, Moazzez, and Mason. Drafting of the manuscript: Sun and Moazzez. Critical revision of the manuscript for important intellectual content: Sun, Moazzez, and Mason. Statistical analysis: Sun. Administrative, technical, and material support: Sun, Moazzez, and Mason. Study supervision: Moazzez and Mason.